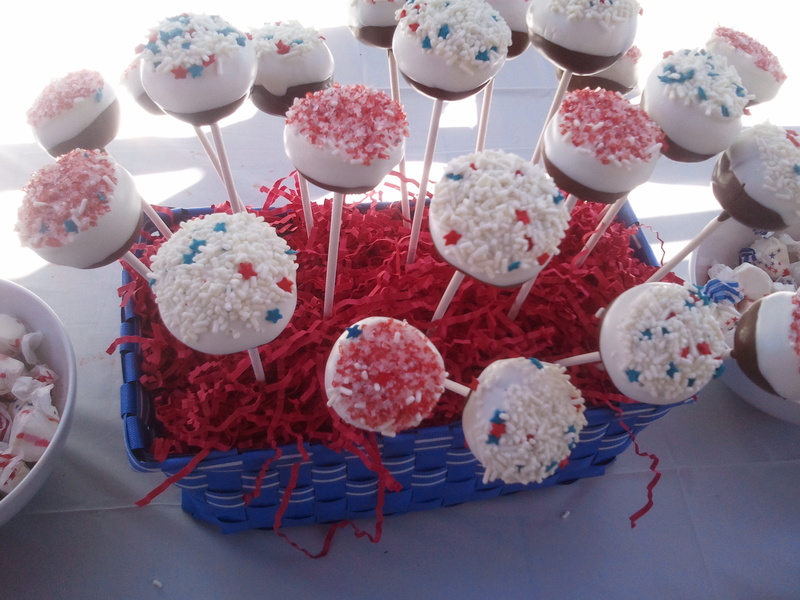 Brownie Pops, and Happy 4th of July!! Hope everyone in the US is enjoying all the celebrations paired with July 4th! And everyone else, happy Wednesday! Personally, I don’t really have any spectacular plans. My husband always sees a Will Smith movie or an alien movie on July 4th, so I think we’re going to see Men in Black 3 and hopefully we’ll get to see fireworks! They’re my favorite part of this holiday, afterall! 🙂 So for today, I don’t really have a recipe per say, but a festive treat nonetheless. 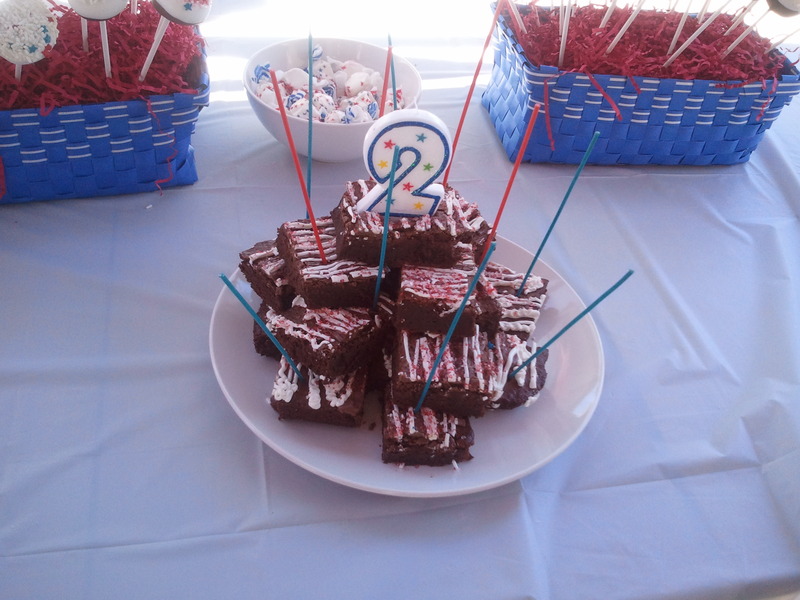 My nephew turned 2 last week and he had his party over the weekend. Since I live so close to my sister now, I helped her decorate and prepare for the party. 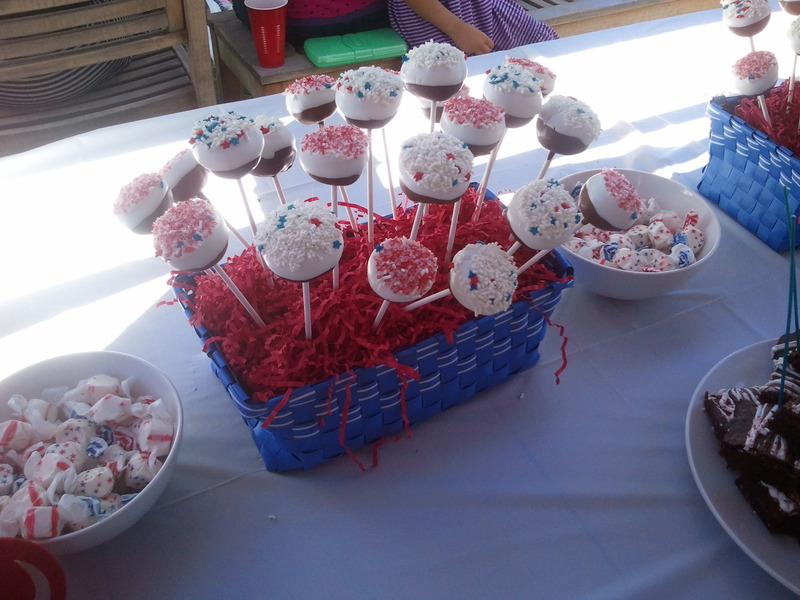 It was a cute red and blue themed train party! I was in charge of dessert, like usual, and her request was brownie pops. She didn’t want to go through the hassle of making cake and making frosting and mixing them together (and by that, I think she didn’t want me to take the time and dishes to do all that :P). 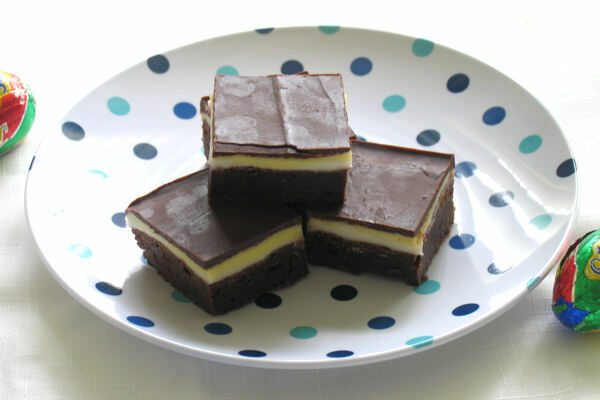 She wanted it simple, so she asked if I had a good fudgy brownie recipe that would require no extra add-ins and could be made into pops due to the extremely moist and fudgy quality of the brownies. I immediately recommended the Baked Brownie. 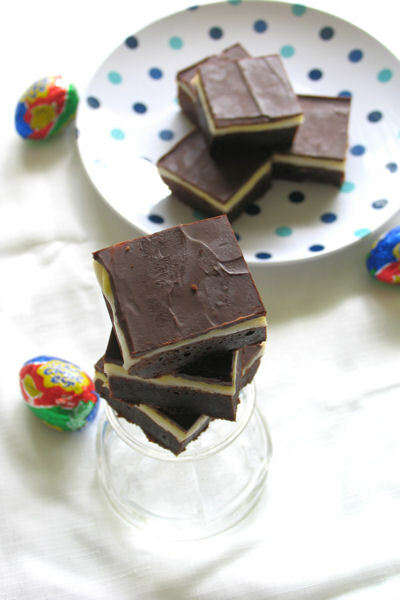 Best brownie ever, and awesome for brownie pops! Like I said, I was in charge of the baking, so with the help of my older nephew, we made the brownies. Once cooled, I squished and rolled them into 1-inch ball, placed them on wax paper, stuck a lollipop stick into them, and froze them for 30 minutes. 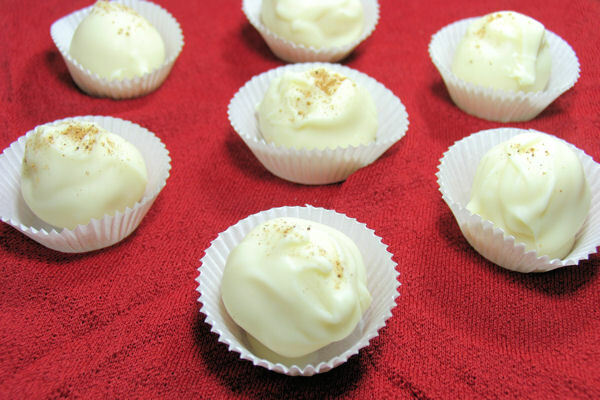 They were then dipped into melted chocolate chips/melts, allowed to set, then dipped halfway into melted white chocolate chips/melts and dipped in sprinkles. For my first attempt at any sort of cake pop/brownie pop, they came out pretty well though they certainly are a bit of work and time! Everyone loved them and they came out quite adorable if I do say so myself, but I think I’ll stick to cupcakes and cookies and whatnot! 🙂 One batch of brownies made about 45 brownie pops, and then we served the other batch of brownies straight up with the extra chocolates drizzled over them and any leftover sprinkles. 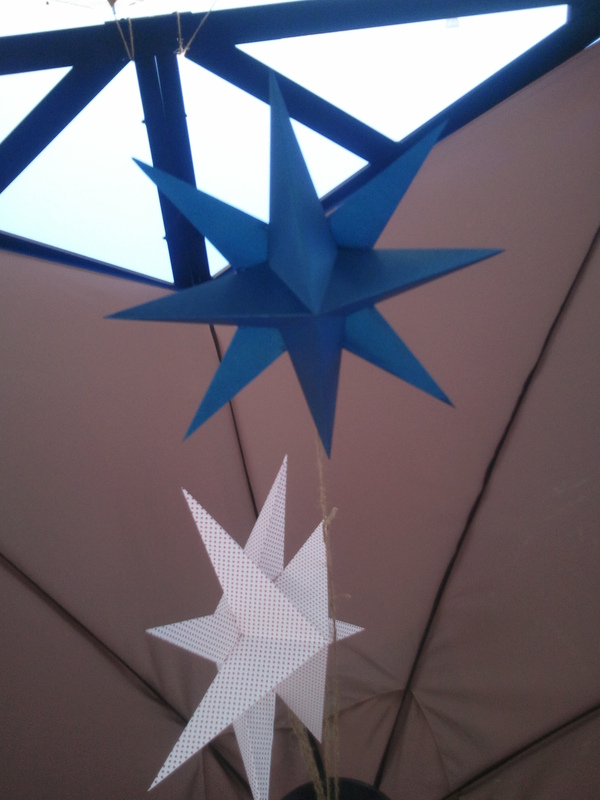 I also wanted to share with you these cool stars that my sister found. You make them yourself with your choice of scrapbook paper, and they were a really nice addition to the party decorations. She now has them hanging in my nephew’s room and they look really cute in there, too! Hi all! Just wanted to wish you a Happy St. Patty’s Day 🙂 And share with you a recipe that is perfect for this fun Irish holiday! This is actually the very first post I ever made on my blog, so sorry that this isn’t anything new! But like usual, I’m behind on my holiday baking… so this will have to do for now, until I get my St. Patty’s Day treats baked up. By the way, I’m totally bummed because I couldn’t find festive sprinkles at Target this year. They always have holiday sprinkles! But maybe I was just too late, because all I saw was Easter stuff… oh well, there’s always next year I guess. 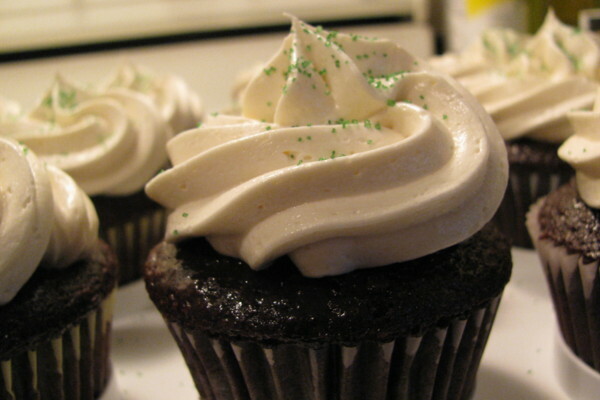 So anyways, if you’re looking for a delicious, alcoholic baked goodie to celebrate, check out these Chocolate Cupcakes with Baileys Buttercream. 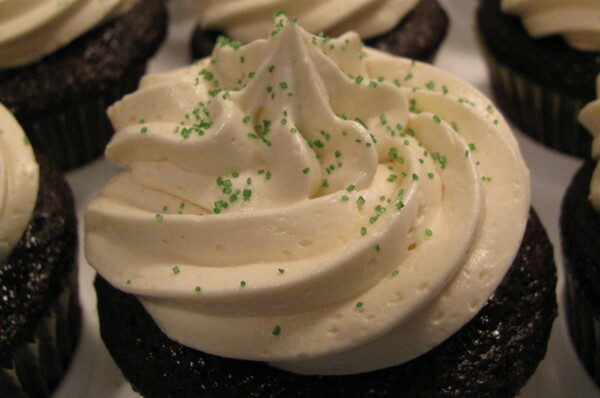 Delicious chocolate cupcakes brushed with Irish cream liqueur, topped with an Irish cream buttercream. 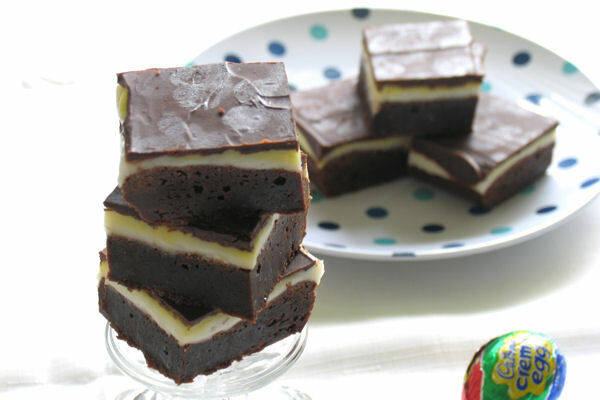 You can even add Guinness to the cake batter, in place of water, to make them extra festive! Nothing says happy St. Patrick’s Day like some Irish alcohols!!! Preheat the oven to 350 degrees F. Line baking sheets with parchment paper or silicone baking mats. In the bowl of an electric mixer, cream the butter and sugar on medium-high speed until light and fluffy, about 2 to 3 minutes. Blend in the eggs one at a time, scraping down the bowl as needed. 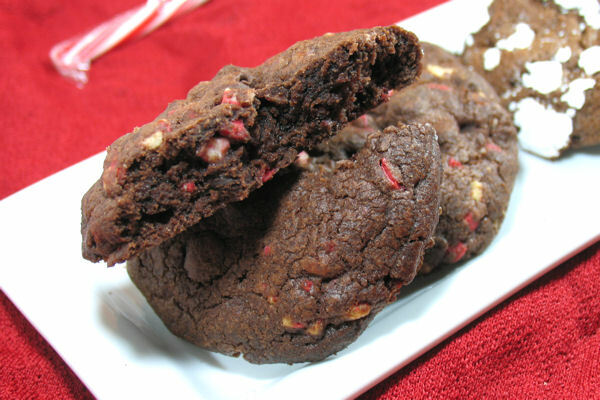 Mix in the cocoa powder and peppermint extract until well blended. Add the flour, salt and baking powder to the bowl and mix on low speed just until incorporated. Gently fold in the baking chips and chocolate chips. On a work surface or against the side of the mixing bowl, mix the dough by hand to ensure even distribution of the chocolate chips. Divide the dough equally into 16 or 20 pieces. 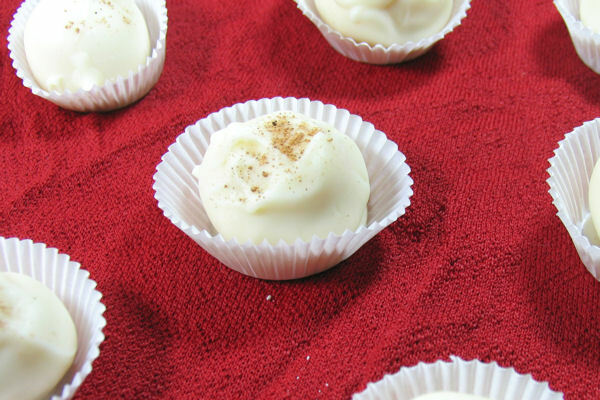 Roll each portion of dough into a ball and flatten just slightly into a disc. Place on the prepared baking sheets, a few inches apart. 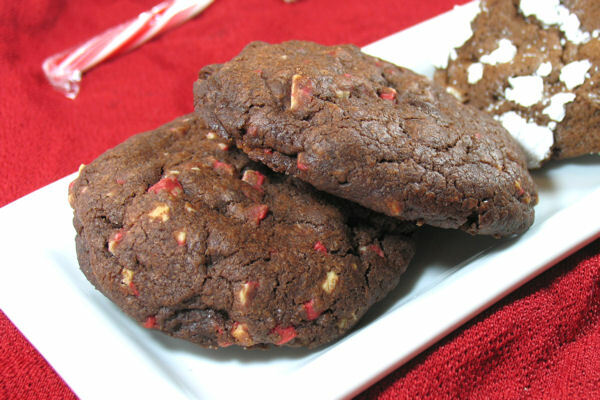 Bake 16 to 20 minutes, or until the cookie edges are set. Let cool on the baking sheets 5-10 minutes, where they will finish cooking, then transfer to a wire rack to cool completely.